Some senior living providers need to both shift their mindset and implement new technology, or they will miss an emerging opportunity to partner with Medicare and Medicaid managed care plans and could be behind the eight-ball for years to come. In managed care, private-sector insurance companies receive federal and/or state funds to create benefits packages as an alternative to traditional Medicare or Medicaid. The idea is that by designing smart plans and efficiently managing their beneficiary populations, the insurers can turn a profit while enhancing health outcomes. Managed care plans, including Medicare Advantage, have proven increasingly popular with consumers, who are drawn to perks such as additional benefits related to foot care or dental. “About 10 years ago, in the Medicare population, about 5% to 7% were enrolled through private insurers. Today, it’s over one-third and growing,” said Anne Tumlinson, founder of Washington, D.C.-based advisory and consulting firm Anne Tumlinson Innovations, at the recent Senior Housing News Summit in Los Angeles. Recent legislative and regulatory changes are opening the door for these insurers to partner with senior living providers in more robust ways. For instance, Medicare Advantage plans will be allowed to cover non-skilled in-home care for the first time starting in 2019, which could open up coverage for certain services offered within assisted living settings. 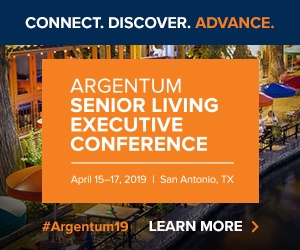 Forward-thinking senior living providers are aware of this business opportunity, and some even believe that carving out a role in a managed care world is an industry imperative, noted Bryan Fuhr, vice president of connected health at GreatCall. But early efforts in this area — such as a partnership between Solterra Senior Living and Mercy Care in Arizona — show that forging constructive partnerships with managed care organizations is no simple matter. It demands an investment in systems and processes and, in some cases, a new way of thinking about the senior living product itself. Managed care plans are seeking ways to expand their enrollment, reduce health care spending among their beneficiary population, and keep health outcomes and customer satisfaction high. Working with senior living providers can help them achieve all those goals, Tumlinson explained. On the cost issue, about 5% of Medicare beneficiaries account for 20% of program spending. These are people with multiple chronic conditions who require a high volume of care and often experience exacerbations that send them to high-cost settings like the emergency room. In other words, assisted living residents fit this profile, so managed care plans see senior living communities as a “hotspot” for better controlling costs. “Talk to anyone who is an expert in population health management, and getting insight into where somebody lives and knowing them in their home setting is the most valuable key to managing their health care costs,” Tumlinson said. Finally, managed care organizations make money largely on volume, and senior living communities present a golden opportunity to enroll a large number of people into a plan. Given all these factors, it might seem that senior living providers would have an easy time gaining traction with managed care organizations. The reality is more complicated. Even before making the first call to a managed care organization in their markets, a senior living provider might have to change its mindset and even the culture of the organization. That’s because working with managed care demands that a senior living provider offer robust health care services and work closely with other health care providers, and this is sometimes unappealing given that the private-pay senior housing model has been built on a strong basis of hospitality. “We work on helping organizations understand that’s a false dichotomy — it’s not health care or hospitality, it’s both,” Tumlinson said. This is becoming more apparent as acuity rises across the senior living spectrum, said Steve Jorgenson, partner and CEO of Solterra, a Scottsdale, Arizona-based provider with eight properties across Arizona and Colorado. Providers that are stubbornly sticking with a hospitality-only model are actually fostering consumer discontent, Tumlinson added. She convenes family caregiver groups across the nation through her Daughterhood platform, and described one of the most common complaints she hears about senior living. Solterra gained confidence in its health care capabilities in large part because it previously ran a skilled nursing facility, Jorgenson said. While the company is now out of that business, the experience did help pave the way for its current managed care partnership with Mercy Care. While managed care-senior living partnerships make sense in theory, there are still few organizations that are actually forging these ties, Fuhr said. His observation is backed up by a recent survey of providers from the American Seniors Housing Association (ASHA) and George Mason University. Solterra is one of the leaders in the field, and other providers can learn from its Mercy Care partnership. That partnership can be traced back to a change in Solterra’s model, as it shifted away from skilled nursing and sought to expand its private-pay and affordable senior housing presence. For Solterra to achieve this goal, particularly with regard to affordable senior housing, it was clear that working with Mercy Care would be a huge boost, Jorgenson said. That’s because Mercy Care is the largest of three Medicaid managed care plans in Arizona. Managed Medicaid offered a potential payment source for low-income seniors looking for housing and long-term services and supports, but Solterra recognized that payment rates were not “great” and began seeking ways to negotiate for a mutually beneficial arrangement with the payer. At about the same time, Solterra began working with GreatCall. In addition to its popular senior-friendly Jitterbug phones and Lively Mobile medical alert, the company offers its Lively Home passive monitoring systems for senior living. It became clear that the GreatCall technology platform could be the tool that Solterra needed to partner with Mercy Care. Through its monitoring, GreatCall is able to flag certain patterns, such as when a resident becomes less active or starts using the restroom more frequently. This can indicate that a health condition has developed or is developing, prompting an intervention to prevent the issue from worsening. By offering this more proactive care, Solterra believed that it could reduce its hospitalizations, improve outcomes and reduce overall health care costs for its resident population — that is, prove its value to Mercy Care. “To the extent you can track [those metrics], you can go to a managed care provider and say, “Look, my residents aren’t going to the hospital and nursing home, and I think you pay for that, right?” GreatCall’s Fuhr said. While this story might seem straightforward, Fuhr and Jorgenson emphasize that the process is longer and more complicated than providers might think at first. For instance, Solterra took years to establish a relationship with Mercy Care — dating back to Solterra’s time running a SNF — and had to find the right champions within the health plan, who understood the senior housing value proposition. The GreatCall implementation also demanded Solterra invest in a robust WiFi network. And because of the size of these investments and the risk as to whether they will pay off in a managed care arrangement, it’s crucial for senior living providers to make decisions that can deliver a return even within a standard operating and payment model. For instance, through tech-enabled early health interventions, Solterra bet that it would boost length-of-stay, driving the bottom-line regardless of whether the Mercy Care partnership bore fruit, Fuhr noted. Furthermore, having the tech in place is just the first step. Providers also need to have the capabilities to effectively respond to the data being generated. This involves staff training, such as teaching caregivers to trust the GreatCall data and take action even if a resident claims to feel fine. It also means having rapid access to a nurse practitioner, physician or other primary care provider who can make diagnoses and write prescriptions. To this end, Solterra is considering hiring medical directors at its communities. And in the case of Solterra, there was also careful math to be done, to get the mix right on the number of Medicaid-driven affordable units versus traditional private-pay assisted living and independent living. Currently, in two recently opened buildings that are in lease-up, about 70% of units are affordable. The Solterra model should provide some inspiration to other providers, but it’s only one potential route to seizing the managed care opportunity, Tumlinson noted. For instance, she is working with Bloomfield, New Jersey-based Juniper Communities on an effort to start its own Medicare Advantage plan, in concert with other senior living providers. The overall takeaway should be that providers need to be educated on managed care trends, clued in to the players in their markets, and be willing to shake things up in their organization to position themselves for the future. “You’ve got to be entrepreneurial and innovative in your organization as a first step,” Tumlinson said.